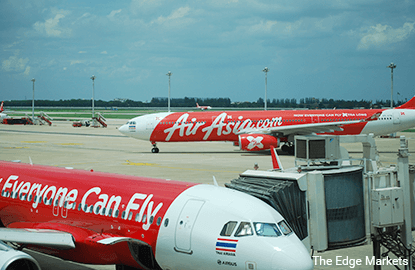 KUALA LUMPUR (July 4): An average of 48,566 AirAsia Bhd and AirAsia X Bhd passengers are expected to depart from Kuala Lumpur daily during the Aidilfitri festive period from July 1 to 9, the budget airline group said today. The group said there would be no extra flights for the Aidilfitri season this year, but it has an increased seat capacity of 1.11 million seats for AirAsia and 291,798 seats for AirAsia X, during the peak travel period from July 1 to 17. Over the course of the period, AirAsia and AirAsia X would have over 6,000 cabin crew working, it said in a statement. The group said the top five domestic destination routes for AirAsia are Kota Bharu-KL, Kuching-KL and Kota Kinabalu-KL, KL-Langkawi, and KL-Penang. The top five international routes, meanwhile, are KL-Singapore, KL-Ho Chi Minh City, Bangkok-KL, Phuket-KL and Hong Kong-KL. AirAsia X’s top five routes departing KL are Melbourne, Taipei, Perth, Incheon and Sydney. The group said 246 AirAsia and AirAsia X flights would depart from Malaysia on Wednesday (July 6), with 270 pilots and 668 Malaysia-based cabin crew on duty. In addition, its Malaysian ground staff, numbering more than 600, would be working daily during this festive period. The group urged travellers to conduct self check-in, as well as to arrive at the airport earlier, to clear travel formalities and avoid expected congestion due to the surge in passengers travelling during this period. At 4.04 p.m., AirAsia was up sen or 0.39% to RM2.59, with 5.6 million shares done, for a market capitalisation of RM7.18 billion. AirAsia X meanwhile, rose one sen or 2.63% to 39 sen at that time, with 4.8 million shares traded, valuing it at RM1.6 billion. Both stocks were among the top active counters today.